Elks National Foundation :: Oh Gosh, Oshkosh! They say time flies when you’re having fun, but for Pam Schedivy, Grants Coordinator at Oshkosh, Wis., Lodge No. 292, it’s soaring. Last year, Schedivy helped the Lodge apply for and receive an Impact Grant, embarking on another new journey for the Lodge and community through The Feed, Read & Arts Program. Since 2006, the Lodge has received $55,600 in CIP grants—a picture-perfect example of what the Elks National Foundation envisioned when it created the Community Investments Program. Each grant project allowed the Oshkosh Lodge to explore where their community needs attention, who they can serve and how they can help. They’ve partnered with the Boys and Girls Club to support youth, the local Standdown to serve veterans, and now they’re volunteering at a local elementary school. Earlier this month, a few members of the ENF staff took a road trip to Oshkosh to see Schedivy and the Lodge’s army of volunteers in action. They were blown away by what they saw in the community, in the Lodge and in Schedivy. 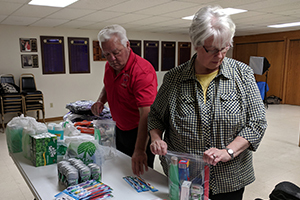 The CIP has enabled Lodges like Oshkosh to make a real significant difference in their community for more than a decade, but it takes a village to make these changes happen as Debbie Doles, assistant director of the ENF, notes after she visited Oshkosh Lodge. 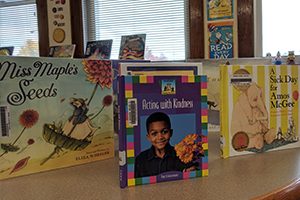 What began as a desire to build a strong literary foundation for children in the Oshkosh community while bringing more visibility to the Elks has turned into the creation of a super community composed of local families, teachers, administrators and students from Roosevelt Elementary School, and, of course, Elks. In addition to the dedicated teachers at Roosevelt, this project wouldn’t be possible without its fearless leader: Schedivy. Watching Schedivy in action gave another member of the ENF’s away team, Senior Associate Christine Robinson, a deeper appreciation for what each Elks volunteer contributes to helping build stronger communities. Each month is dedicated to one aspect of the Lodge’s project: feeding, reading or creating. During the “Feed” month, the Lodge hosts a “Fun Night” at the school, providing and serving food to children and their parents around dinnertime. There are also board games to keep the kids occupied after dinner is served. 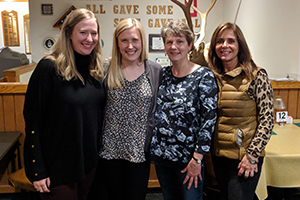 Katrina Gesell, a staff member at Roosevelt Elementary, worked with Schedivy and the Lodge to run the Lodge’s “Fun Night.” Gesell, who has worked with afterschool programs for six years, said the dinner was one of the best experiences she had ever been a part of at a site level. At the beginning of the school year, the Lodge also provides a yearlong Scholastic Weekly Reader subscription to students, donates books to the library and sends books home with students to read over summer break. During the reading months throughout the school year, Elks volunteer to read to classrooms. Schedivy’s joy for serving has also spilled over and onto those closest to her. One of the reading volunteers is her good friend, Gina Muegge. She’s the reason Schedivy moved to Oshkosh, and they’ve been working together, logging many miles between them, ever since. Schedivy also shared how she selects the reading materials that’s donated or read. She gravitates toward books written by accomplished women like Nobel Peace Prize Winner Malala Yousafzai’s Malala’s Magic Pencil and Mae Among the Stars by Mae Jemison, the first African-American woman to travel to space. As Oshkosh’s first female Exalted Ruler, Schedivy knows what it’s like to break barriers and wants to show students they can do it too. During the art months, the Lodge has a few different paintbrushes up their sleeve. One month, they worked with Renee Schumacher, the art teacher at Roosevelt, to host acrylic painting on canvas with two fourth-grade classes. Another time, Elks brought African instruments to music classes at the school. The students learned about the culture by singing African songs to the beat of the instruments. “This project has not only been a gift, but a shared joy,” Schedivy says. Elks and kids are sitting elbow-to-elbow, learning about new instruments, reading books and enjoying wholesome dinners, all while strengthening their Elks community. When the students recognize an Elk at the grocery store, they greet them like a new friend, and that’s what really matters at the end of the day. “Our work is not in vain and touches those outside our own community in profound ways,” Schedivy says.